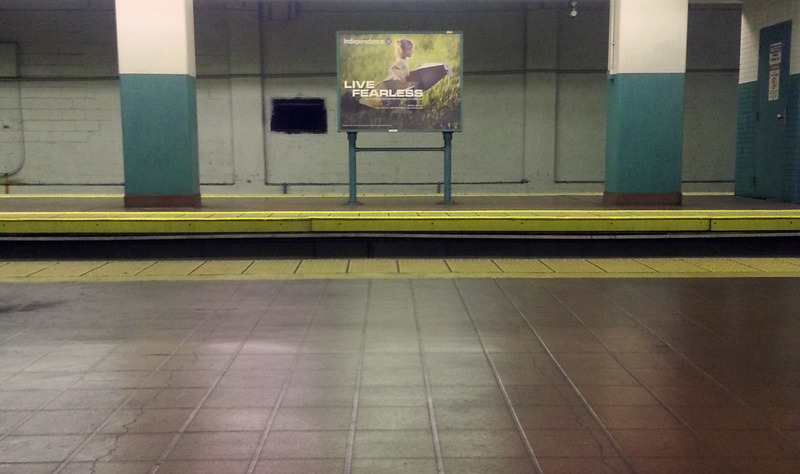 I sit alone in a vacant train station, but its vacancy is only my perception. It is semi-crowded, yet I have this feeling that everyone seems to be far away from me. I try to occupy my mind, but the lingering smell of oiled tracks and trash that has yet to be emptied only adds to the lump in my throat. My iPod shuffles music, and I have the urge to turn it off because every song pulls his face into my mind. I hope for my train to come on time, anything to get me off of the cold bench that I sit on alone. I’m surrounded by hand-holders, married couples, and young lovers. I avoid looking at them, and instead glance at the clock that seems to keep saying 12:47 p.m. There are billboards across the track that I begin to take notice of, and I realize I’m doing more than just surveying what is around me. The advertisement I focus on is for affordable health coverage, emphasizing that if I have this insurance, I can “live fearless.” The point is obvious. I’m supposed to think that if I get this health insurance, I can surf the seas, jump off of cliffs, explore the world, or be as reckless as I possibly can. I can live fearless with nothing to worry about. I realize how often I worry as I stare at this advertisement. I worry about this idea of being fearless. I worry about my life in two years, I worry about where my family will go, I worry about my friends and what road they take, I worry about money and grades and opening my heart to someone new. I hate worrying, and I hate using expressions about the heart because it seems cliché. The heart is just an organ that beats and pumps blood and keeps us living. So frequently we talk about the heart in pain, the heart swelling, the heart flipping and turning, the heart growing warm, the heart feeling love, his sympathetic heart, her aching heart. Still waiting for the clock to turn to 1:16 p.m., I picture his face, again, in the window as his train started to pull away from where I stood. My heart feels like it’s breaking, I thought. If my heart feels like it’s breaking, then does that mean being with him is when it is whole? Does it mean my heart is complete when I am with him? My train pulls up, interrupting the thoughts I had. I still do not know if I can be fearless, but perhaps with him in my life I can begin to have courage and forget about being afraid. I sometimes wonder if I will find the answers I am looking for. But, in this moment, I am sure of one thing, and that is that I am ready for a new destination.